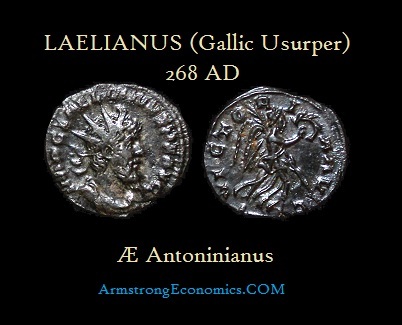 Ulpius Cornelius Laelianus was one of the Thirty Tyrants listed in Historia Augusta during the late 3rd century AD. Laelianus led a revolt against the Gallic Emperor Postumus from the city of Mainz (Moguntiacum). His attempt to take the throne was ultimately unsuccessful. It is not known whether he was killed by Postumus (259-268AD) or murdered by his own troops. Postumus quickly defeated Laelianus and broke with an old Roman tradition refusing to allow his troops to sack the usurper’s city of Moguntiacum (Mainz). This decision proved to be fatal for ultimately this led to his own troops assassinating him in turn. Little is known about him but he appears to share the same nomen as a prominent Spanish noble family, the Ulpii, which included Emperor Trajan (98-117AD). Perhaps with this family connection to Trajan, Laelianus was able to muster support among the troops. 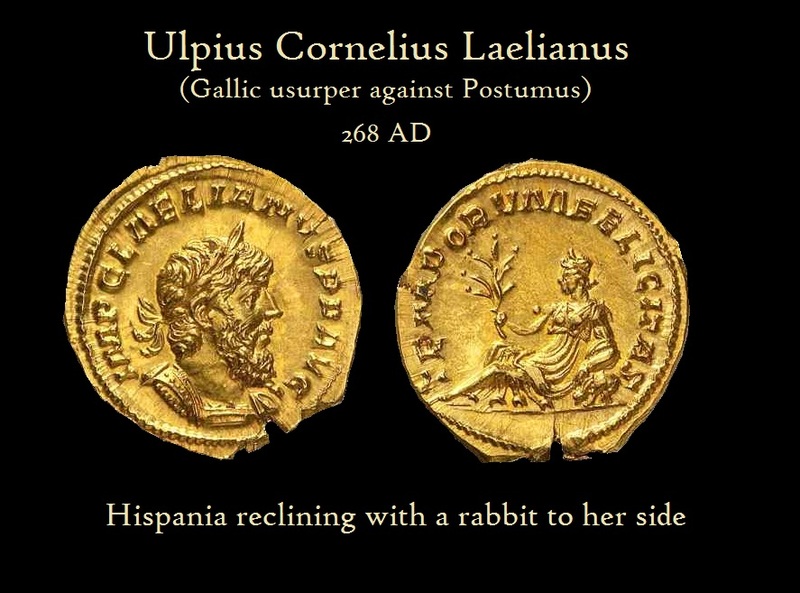 This would explain the reverse of his gold aureus picturing Hispania reclining with a rabbit to her side. This may also perhaps explain the fact that Spain simply broke with the Gallic empire and allied itself with Claudius II, after the death of Postumus voluntarily. In consequence of this man’s rebellion in Gaul, Postumus, the bravest of all men, was put to death after he had brought back the power of Rome into its ancient condition at the time when Gaul was on the brink of ruin because of Gallienus‘ excesses. Laelianus was, indeed, a very brave man, but in the face of rebellion, his strength was insufficient to give him authority over the Gauls. He was killed, moreover, by Victorinus, son of Vitruvia, or rather Victoria, who was later entitled Mother of the Camp and honored by the name of Augusta, though she herself, doing her utmost to escape the weight of so great a burden, had bestowed the imperial power first on Marius and then on Tetricus together with his son. Laelianus, in fact, did to some extent benefit the commonwealth; for many of the communes of Gaul and also some of the camps, built on barbarian soil by Postumus during his seven years, but after his murder plundered and burned during an incursion of Germans, were restored by him to their ancient condition. Then he was slain by his soldiers because he exacted too much labor.